A consequence of the abundant rainfall that most of Minnesota has received has been an increase of springtails found in homes and other buildings. 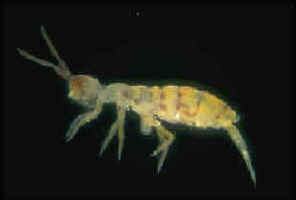 Springtails are small insects that are associated with moisture. They range in size from 1/16 - 1/8 inch in length. Most are slender, although some are round and stout. They are typically dark colored, gray, black or brown, but some are white and some even iridescent and brightly colored. Springtails lack wings but do have the ability to jump. Springtails as a group are very numerous, living in a variety of moist habitats including in soil, leaf litter, mulch, decaying wood, and around bark where they feed on fungi, pollen, algae, and decaying plant matter. They can live inside buildings when high moisture exits, e.g. around plumbing leaks. They can also seek shelter indoors when areas around the outside of the home become excessively wet. Fortunately, regardless of the number that are seen, they do not harm people or damage property. But they can be annoying when conspicuous numbers are present. They key to controlling springtails is reducing moisture; they cannot survive if sufficient moisture is not present. However, the reason springtails are present will influence how easy it is to get rid of them. If springtails entered structures to escape excessive damp outdoor areas, they are expected to go away on their own as the rain lessens and the humidity goes down. Use a fan or dehumidifier to reduce indoor humidity to help reduce springtail numbers until they are gone. However, if there is some sort of ongoing moisture problem, springtails will continue to be an issue. Check indoors for sources of moisture and areas of high humidity. The moisture source could also originate outdoors, e.g. rainspouts that do not carry the water far enough away from the foundation or landscapes that slope towards buildings. Correcting existing moisture conditions is a long-term solution in springtail control. Although it may be tempting for some to treat springtails with an insecticide, the products available to residents are not very effective against these insects. Moisture control is the most effective strategy.